The Turkish military elite fled, along with a portion of the Muslim population. Their property was appropriated by the French, who also took control of religious endowments. Despite mass protest, the Katwaja Mosque was converted into a cathedral and the city’s covered market and its mosque were demolished and replaced. The Kasbah (Muslim neighborhoods) was spared, as was the New Mosque. Algiers’ infrastructure was transformed. Streets were widened, new buildings erected, the port improved, and a base of colonial administration established. By 1954, the city had 600,000 residents, half of them European. The same year saw the beginning of the War of Independence, spurred by rural disparity and hardship. Large numbers began migrating to the capital from rural areas, pushing the demographics further in favor of the native population. From 1956-1957, the National Liberation Front (FLN) conducted an urban guerilla war campaign against the occupation, taking around 1.5 million lives. 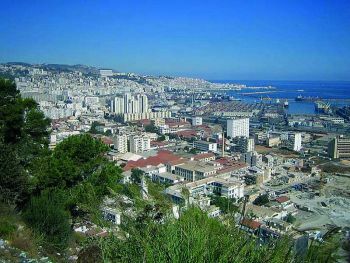 When the French withdrew in 1962, the city had been ravaged by terrorism from both parties and sections of downtown Algiers were burned by settlers before they left. Since independence, Algiers has become a vital Mediterranean shipping center. Its population stood at 1.5 million in 2011. Meanwhile, the city has dealt with numerous crises, including housing, infrastructure, unemployment, and civil unrest. “Algiers,” in Philip Mattar, ed., Encyclopedia of the Modern Middle East: vol. 1 (Detroit, Mich.: Macmillan Reference USA, 2004); “Algiers,” in Kevin Shillington, ed., Encyclopedia of African History (New York: Fitzroy Dearborn, 2005); “Algiers,” in John Middleton and Joseph C. Miller, eds., New Encyclopedia of Africa (Detroit: Thomson/Gale, c2008). Fitzroy Dearborn, 2005); “Algiers,” in John Middleton and Joseph C.
Miller, eds., New Encyclopedia of Africa (Detroit: Thomson/Gale, c2008).